Open boxes.html and save it as idclass.html. Copy the whole div element in idclass.html. Paste it under itself so there are now two identical div elements inside the body element. So far any styles in boxes.css apply to all elements of a certain type (e.g. paragraphs or h1 elements). 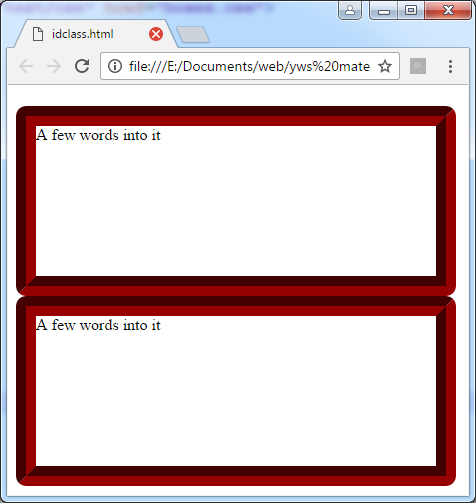 Save idclass.html and view in a browser to see the two identically styled div elements. The # symbol tells the browser that the text that follows is an id. Make sure you have saved both files and view idclass.html in a browser. The first div should be the same but the second should now have a different colour border. You can change any other styles for just this one div by adding rules to the rule set. Save both files and view. You should see four div elements and two paragraphs. The bottom two div elements and the second paragraph should all have green backgrounds. You can include more than one class or ID like this: class="first another onemore";. Classes are used much more than IDs because you can use a class for one rule set or many so it is more flexible. Some people will only ever use classes. However, you should technically be using IDs when you only want to style one item. It will still work but it looks a bit silly.